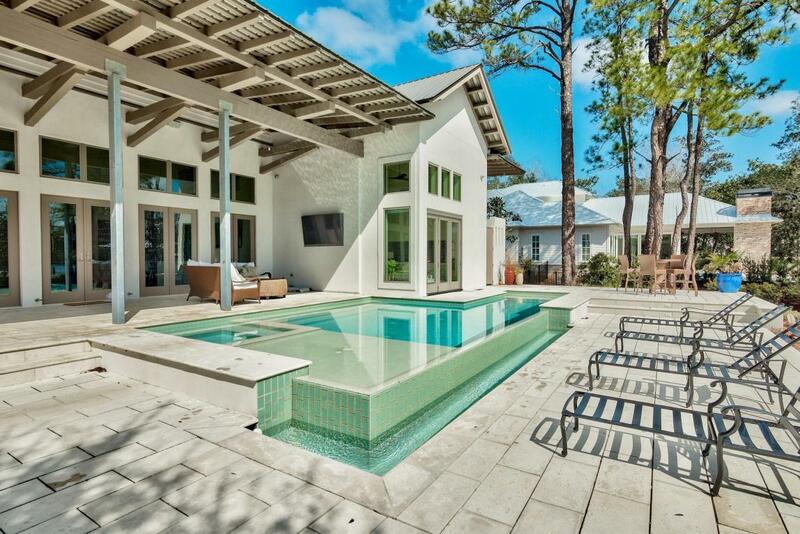 430 Botany Boulevard is located in the gated community of Botany Bayou ideally situated between Miramar Beach & Scenic 30a. Natural beauty abounds on the wooded lot of mossy oaks, mature magnolias and shrubby palmettos. Boat dock and lift along with additional jet-ski lift enable boaters to take full advantage of life on the water from Day 1.The Modern-inspired design of this contemporary beauty are realized before even stepping foot inside. White concrete with tan accents and clean lines create eye-catching curb appeal. Upon entering the home, you become immersed with the idea of bringing the beauty of outdoors inside. The 24 foot cathedral ceiling allows for a wall of french doors with oversized transoms to brighten the home with natural lightThe view from the kitchen and living room is stunning as it overlooks the negative edge, custom-pool/spa and the smooth current of Mack Bayou. The kitchen features top of the line Wolf and Sub-Zero appliances including induction stovetop, steam oven and "Sonic" ice machine in the Butler's Pantry. In the master bedroom it is difficult to decide which attribute makes the room so cozy and appealing. The roofline of the home creates a beautifully interesting ceiling line and the elegant accordion doors once again create the invitation of bringing nature indoors. In the master bathroom you will find expansive double sink vanity, oversized walk through shower into the outdoor shower, deep soaking tub overlooking the backyard and generous master closet with custom shelving & cabinets. Off of the master bathroom there is an ample workout room before arriving to the office space. Upstairs are two additional bedrooms with large, accommodating closets and private bathrooms. Approximately 900 square feet of finished space above the two-car garage is ideal for game-room & theater or an additional master suite.